Busy humans must make time in their day to meditate. Felines however, can meditate whenever they want, and can do so with great ease. 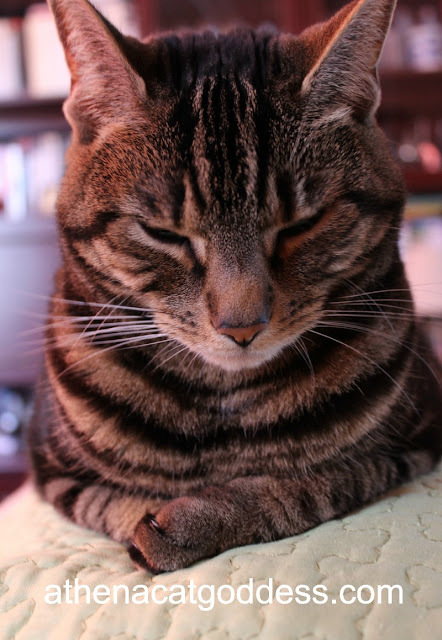 I see you have perfected your meditative pose. We are so fortunate, aren't we, Athena? As only a cat can! Great advice for humans to take a cue from us. Purrfect pose! Great peaceful pose, you've got going on there. We agree.... but petting must come first. We humans could take a cue from you and practice meditation more often! Keep up that inner peace Athena! You look absolutely purrrfect while meditating :) My kitties love to meditate too. Ya looks like ya got dat down pat. Athena, you are very wise. Us humans really should watch and learn from kitties. Ahhhh,,,,if only people could learn to go to "that place" when they need to,,,,it would be a much more peaceful and loving world.